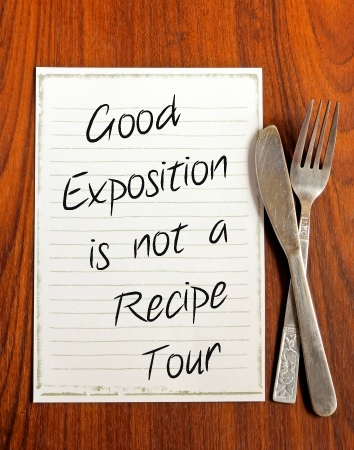 Some people wrongly suggest that expository preaching is like explaining a recipe, rather than letting the listeners savour the flavour of a well-cooked meal. A good meal is the goal, not an explanation of the recipe. For some preachers this is an accurate description of their preaching, but don’t judge expository preaching by bad examples of it. An expository preacher is primarily concerned with communicating the point of the passage, not seeking to explain the point of every detail. Expository preaching is about effectively and accurately communicating the text, not using the text to offer a lecture in sermonic method or applied theology. A good expository preacher knows that a story has its own way of carrying and conveying its point, and that a poem works in a different way. Thus a good expositor preacher, preaching a story, will not dissect it into a lifeless and experience-free recipe, but will communicate the story as effectively and accurately as possible. 1. We start with the text as it is. Expository preaching is about the text being boss of the message, not the message squeezing the text into an outline or idea that doesn’t quite fit. 2. We ponder what needs to be added to help the text communicate effectively. Is any explanation necessary to allow it to communicate? Perhaps an underlining of the point, exposing it for clarity, yet timed appropriately to not undermine the impact of the text? Maybe it would help to make explicit the contemporary relevance of the story, or maybe how it fits into the bigger story of God’s Word and our world? 3. We try to avoid any undermining material. Unnecessary and endless explanation of details, numerous unnecessary or disconnected illustrations, ill-timed statements of the main thought, commentary style titles for each segment of the passage, or even a personal delivery manner that contradicts or leeches away the emotion, tension or energy of the text. Anything unhelpful should be purged from the message so that we are preaching the message of the text, not preaching a message using a text. When you preach a story, or a poem, or whatever, be sure to be expository . . . but not the wrong kind that feels like the explanation of a recipe! Perhaps expository preaching is the fine wine that brings out the flavour of the meal, but does not dominate it? This is probably a popular suggestion, Mike! I am wondering if expository is a commitment on the chef’s part to make this meal have the same effect as the original recipe intended?